In the swing of blogging! Well I could just keep filling up my space with pictures and stories of weddings and I will talk about a few more that I think could be of interest, but will probably take my blogging more in the direction of information to help bride’s who may be contemplating whether to hire a co-ordinator, or which vendors to choose, so be looking for blogs in the future that I hope will really help in your planning and thought process. Hadn’t been in Cancun for around 21 years and ended up going back two times this year. I have talked already about a trip I did where I was checking out the NH Hotels for destination weddings and honeymoons, today’s blog is from our family trip down there in July. We stayed for 12 nights and at three hotels during that time. The best was the Casa Magna/JW Marriott combo where you can stay at either and use the amenities of either. They are right next door to each other so perfect. Both have great restaurants and pool areas. The Spa at the JW is excellent, imagine showering from the 8th floor or whatever I was on with a 1/2 length window looking out to the Caribbean and about 10 shower heads/jets working away, fab u lous. While we were there an Indian wedding had pretty much taken over the JW. They had the pre wedding day festivities outside the night prior, and on the wedding day we watched the groom come along the beach on a horse surrounded by the cheering family/music etc, it really created a lot of interest from the hotel guests who had never seen anything like that before. Unfortunately before he got to the area where he would go to the cere site it absolutely poured down. So they all got drenched and as the ceremony was going to be outside on a Gazebo Lawn with ocean backdrop at the Casa Magna, they delayed until the rain was gone (doesn’t take long) and gave everyone time to go and change and refresh hair and makeup (the bride was nice and dry this whole time inside as was her family). They did get married outside about an hour later and then did their dinner reception outside on a large lawn at the Casa Magna with great lighting and colorful linens. A great celebration for those to remember who were lucky enough to be invited and attend. The other great point to note with these locations, is that they have ballrooms and banquet space including one unique covered outdoor/indoor area where I could see a large ceremony being done if you had to move in and not feel too sad. During our days there we saw quite a few ceremonies being set up on the beach at different locations/resorts for intimate groups for sunset ceremonies. Very fun, and obviously an alternative desination that a lot of couples are choosing. 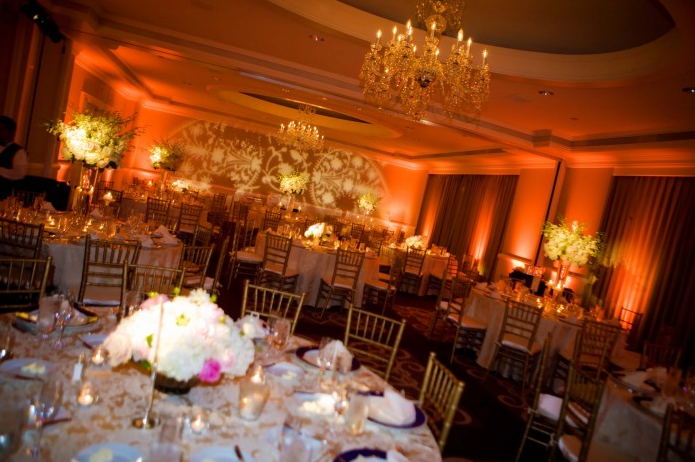 Moneli and Tommy had a great celebration at the Ritz tearlier this year. Why I wanted to share this one was even though it was not my first Persian wedding at the Ritz, it was the first time we had done the sofreh outside on the Gazebo Lawn. That area can be really windy and for the amount of work that goes into a sofreh it could have been a challenge if the weather did not co-operate. The great news is it did. 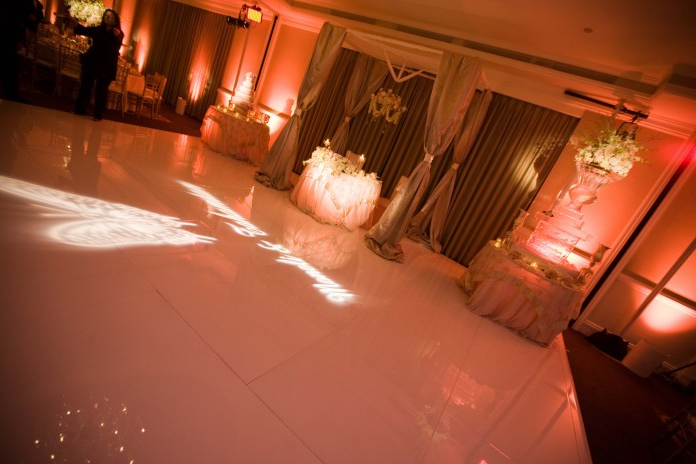 So here you will see the ceremony set up and then the ballroom with all the decor elements that Moneli wanted to have to create her perfect celebration. Very pretty. Thanks to www.bobortiz.com for the great shots. Speaking of the Ritz-Carlton, Laguna, this is a shot of a cake that really caught my eye this year. I hope the beauty of it comes out in this shot, in person it really made you stand there and just admire it. The wonderful news is, not only do the Ritz’s cakes look fabulous (and they can create anything) they taste great too. None of that what I call ‘fairy’ cake that disappears in your mouth or tiny slices, your guests get nice large, thick slices of great tasting cake. No-one leaves a wedding there hungry!! 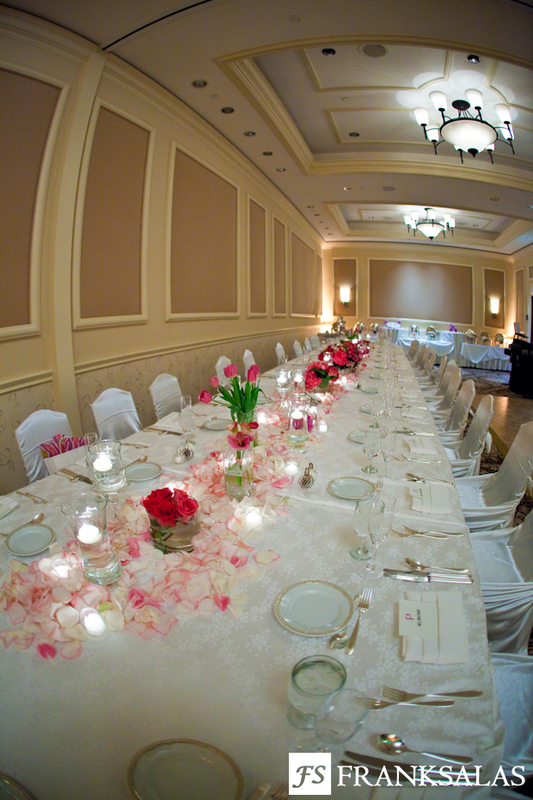 Here is a lovely intimate wedding also done earlier in the season, using two locations at the Hyatt that aren’t used as much as they should be. The ceremony was done in the Spa Courtyard, and the beauty of this site is not only the surroundings/very nature like, but that the sun is behind everyone, so no one is complaining about sun in their eyes. Then the Fountain Ballroom which is a lovely smaller ballroom, no windows, but the guests have cocktails outside in the courtyard and can see over to the beach area, then they come into this enclosed room that by using great linens/chairs and some uplighting can become the celebration to remember. No-one wanted to leave this event as the room just felt so warm and cosy, they sat there chatting at the tables for quite a while after the music was off and done. That says a lot for the atmosphere created, yay. Thanks to Alison of Bleu Cotton Photography for the two shots below. Always fun to work with. 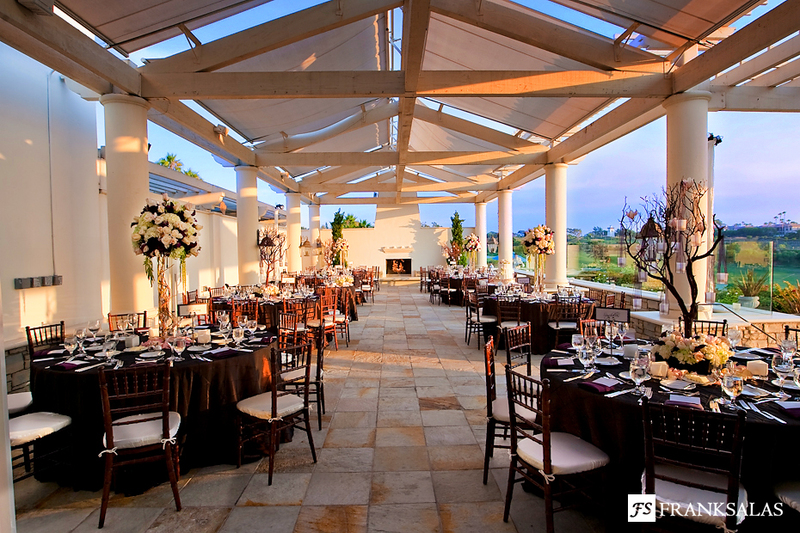 Here is a ceremony site where the couple also used the Fountain Ballroom but the groom wanted a coastal facing site, so very different to the Spa Courtyard above. The guests were in the shade though which was nice. I really love it when I have the more intimate affairs and we can create a fabulous table. Tara was great to work with and together with her vision, fabulous Amanda of Fantasy Florals, and a great groom Jim who agreed with every decision Tara and I made (way to go Jim), another great celebration was created and enjoyed by the lucky guests, and not wanting the night to end, they closed the hotel bar down I believe much later!!! Thanks to Jeff of Moondance Dj services who did a great job handling both the ceremony music through cocktails, and then dinner and the party!! Photos courtesy of my lovely www.franksalas.com, as always the best to work with . Well, that went on a bit longer than I intended. Until my next one. Happy Thanksgiving to all. This blog is going to be about another great location for a couple looking for a room with a view that gives their guest’s a range of experiences from beginning to end. 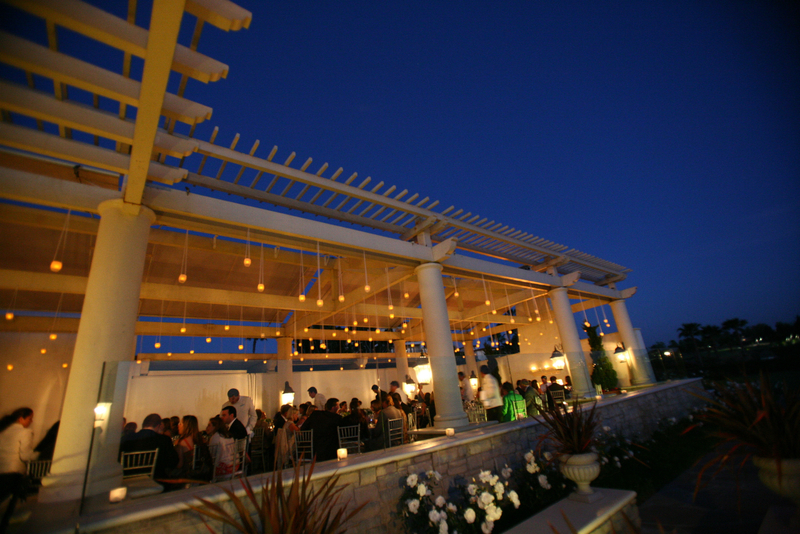 Club 19 is located down at the golf club area at the St Regis Resort in Monarch Beach. 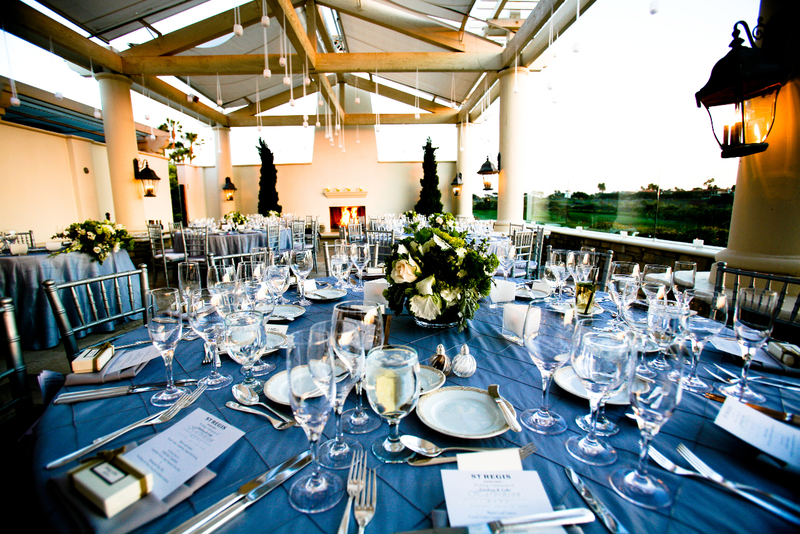 So what you get here is an opportunity for your guests to stay at a fabulous resort and get spoiled with top notch service and amenities, but enjoy a wedding celebration that has the views and feel of a golf club resort, which normally do not have the hotel rooms near or associated with it. 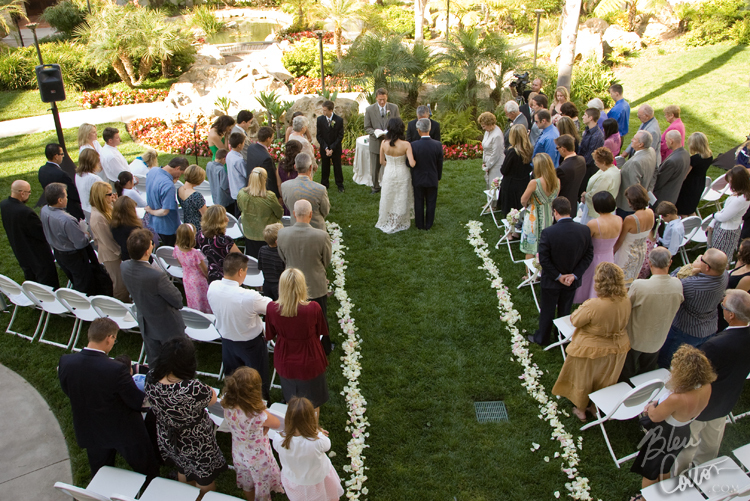 Ceremonies are held at the Botanical Garden which is a realy wonderful Italian style/feel ceremony site that has golf course views that seem to flow into the ocean as the backdrop. A wonderful gazebo with a beautiful wrought iron top and Italian statues and planters complete the feel of this site. This ceremony site can do up to 120 but 80-100 is perfect, and for any groups that are smaller it is amazing how the site seems to wrap itself around them and it never seems too big. Your guest’s are escorted after the ceremony to the lower patio of the Club 19 building or to the Courtyard that is at the Club’s entrance, for cocktails. 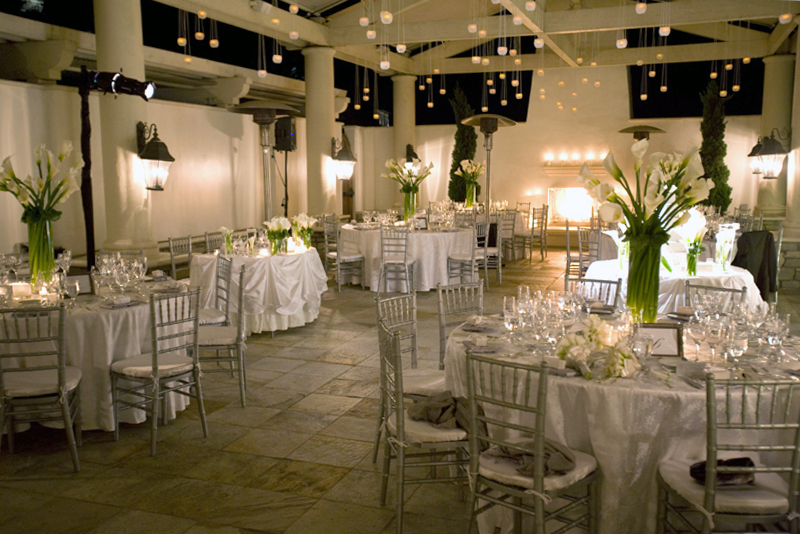 Then they go to the dining area which is outdoors, so wonderful. 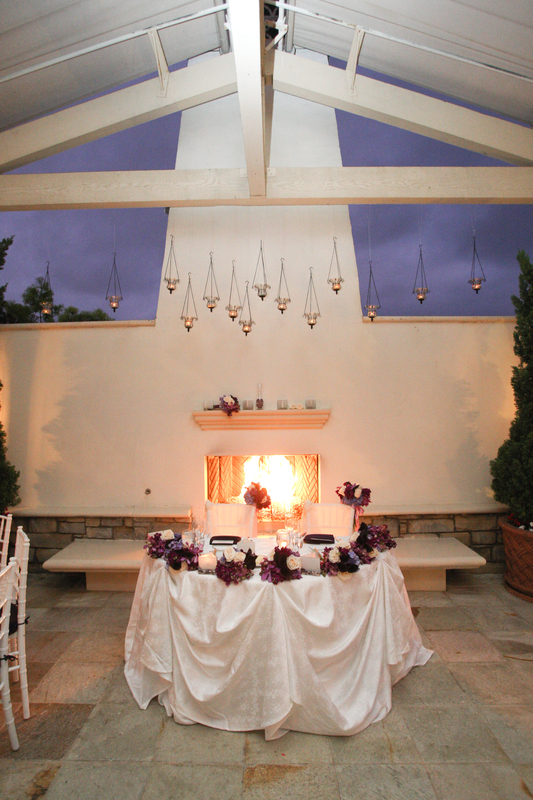 I have had bride’s leave this area as it is and just use linens and florals to create the feel/mood, I have had others swag the open air ceiling and add chandeliers, and this year I had three different brides hang from 60-100 candles from the rafters, and the neat thing was, three different florists/designers were used and we had three different looks. The perfect number in my opinion for this dining area is 80-90 which would be tables of up to 12 and includes the sweetheart table. With this size we can center the sweetheart table amongst the guest tables and also have tthe cake table in the dining area/centered. 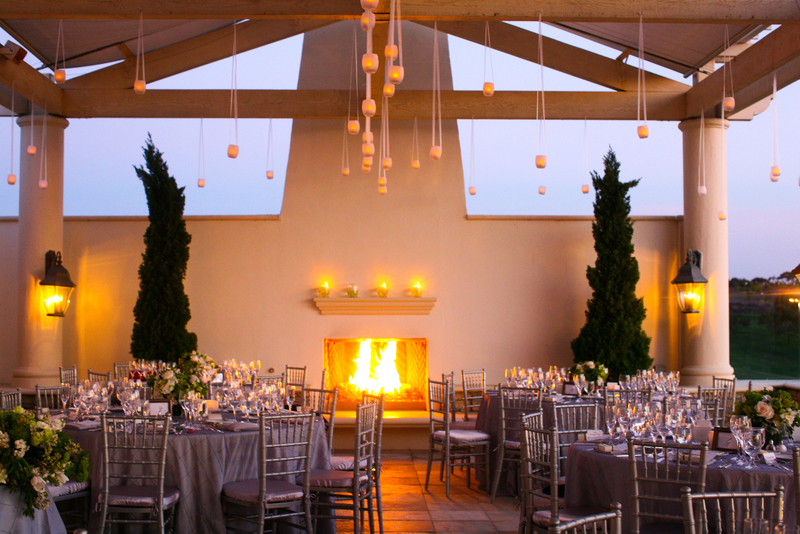 I leave the aisle way clear so everyone has a clear view down to the outdoor fireplace and it seems really spacious yet intimate. When you get to 100 we need to add two more tables which unbalances things but totally works and if you are not able to maximise all tables to 12, then we have to put two tables on the lower level, or do one big royal dining style table. So it separates the group but as long as you put the right people down there and make the tables gorgeous, those guest’s do not seem to mind. After dinner we invite everyone to follow the couple into the Club and now the party begins. 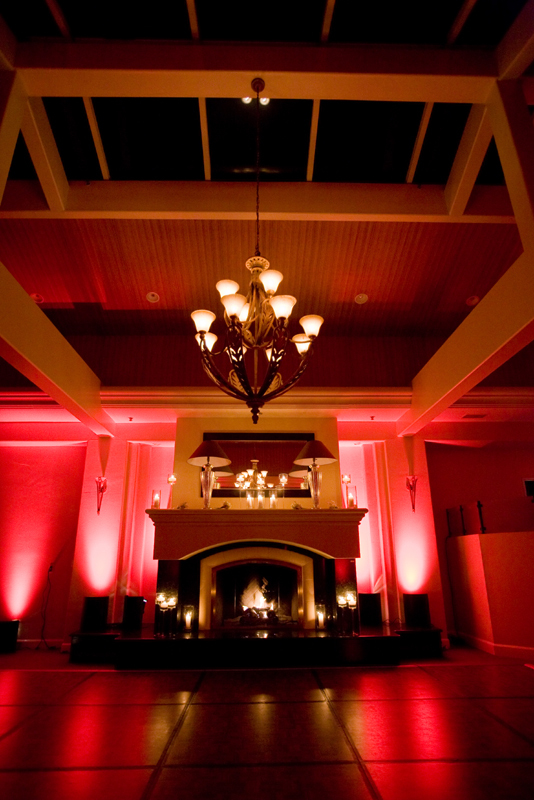 You can totally change the feel from what was outside to a nightclub feel inside with lighting, furniture, candles, colored dancefloors, all with the inside fireplace adding to the look. When the guests were walking through during dinner when it was lighter they didn’t think much about the area, but after dinner when they come in and it is dark and what we have created inside now shows, they can be blown away. You can create any kind of vibe you want. The great part of this open air/feeling location is, if some guests want to stay at their dining tables during the dancing time, they can see into the dancing area and not feel out of it or miss anything that may be going on. I see people sitting infront of the outside fireplace chatting, at their tables, in the courtyard or just lounging in the dancing area on cool furniture or sitting at the bar. This venue really can be all things to all people. Enjoy the different atmospheres that we created below, thanks for the photos to: Larry Crandall, William Innes, Karen French, Frank Salas, Lauren Hillary. Well until next time. I am signing off while sitting here in Cabo San Lucas. Am checking out a few resorts with destinations weddings in mind. Some fabulous options for sure. With this blog I am going to focus on my favorite spot in the OC for the intimate affair, here you don’t have to give up 5 star service and style to feel like you can reach out and touch the ocean. I have orchestrated celebrations in this spot for as few as 20 guests to the maximum the room can hold which is 74 with a sweetheart table. 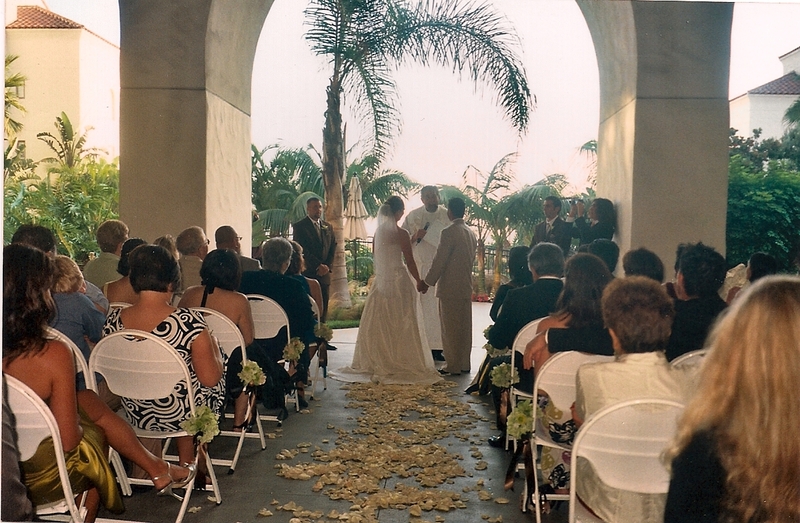 You get married on the Sunset Terrace which is a mexican tile feeling patio/terrace that has front on views to the gorgeous Pacific Ocean (hello Hawaii in the distance, ok Catalina kind of is in the way, but it is over in that direction!! 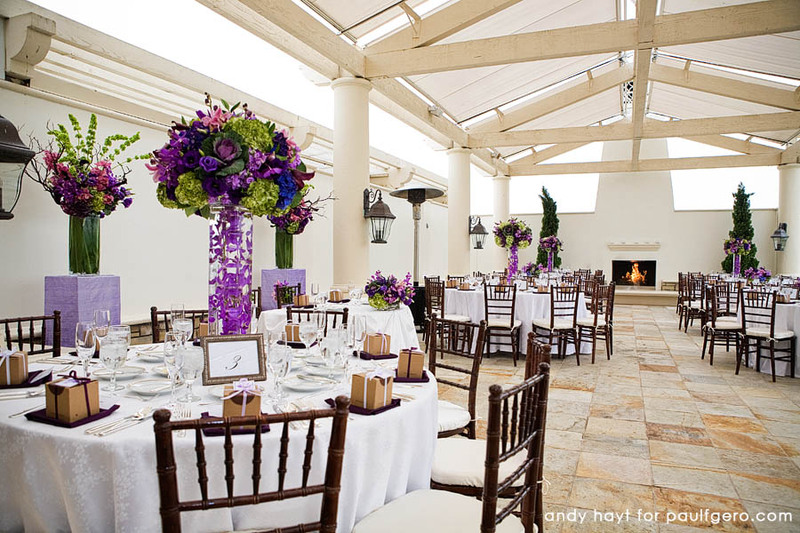 ), after the ceremony cocktails are held on the lovely semi circular balcony that looks right down to the surfers and waves crashing on Salt Creek Beach, and then we open the french doors and guests enter a lovely room that could be a formal dining room of someone’s lovely home. 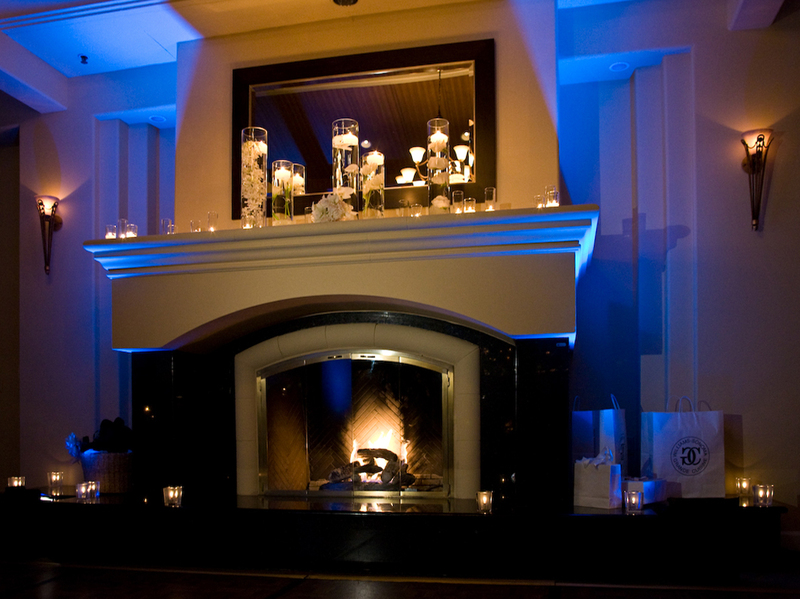 The Plaza Room has windows, a fireplace and mantle (great for putting pictures or flowers or candles on, to add that personal touch), a lovely chandelier, and the colors in the room don’t fight with any feel you may be wanting to do. I just love it. Below you will see various shots of the same room, yet they look so different. I have done the royal dining table a few times this year, the one below is one of my favorite looks as it is very rich and serene feeling and the table looks so inviting the guests always gasp when the doors open and they see this look. I did another royal table a few weeks ago with all low vibrant colored florals/candles and petals to tie everything together, white linens and fruitwood chivaris, and it looked fabulous also. Using the same royal dining table I also did one with vibrant purple linens and jewel tone florals and it looked brilliant. It’s so hard being in the room watching the guests dining and talking, you just want to sit down and join them, it’s a great experience for those guests lucky enough to be part of such an intimate event. 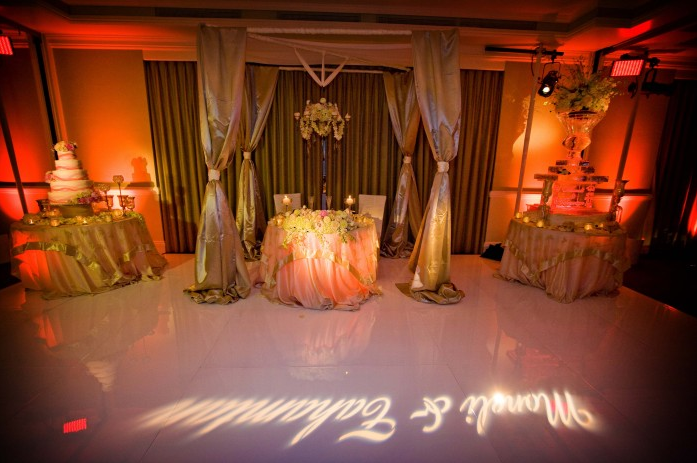 The colors/look in the room are only a part of the whole experience though, the service from the ladies and gentlemen of the Ritz-Carlton is what elevates this experience to ‘awesome/best wedding I have ever been to’, comments that we hear as guests are departing. Most of the ladies and gentlemen at this property have been here a long time, and take such pride with each event, I look forward to working with them always. The food and beverage is ruled over by chef Jim who really takes a great interest in each event and personally checks the plates before they go out to the guests on the day. The team up in the office is wonderful. Headed by Kimberly, there is Fernanda and Kelly who are the first point of contact for most couples, and once booked you are given your service manager who will be with you throughout the duration of your planning/event. Great group of ladies and gentlemen (yes, you may have a man)who take great pride and care and are always around on the day to ensure all is going well and you are happy. So from the first call you make to inquire at the Ritz-Carlton, through the planning months/process, onto the wedding day and until you leave the resort the next day or a few days later, you are well taken care of, and know it. Then there was Jane!!! She loves champagne, I love champagne, what a great team we were, and the fun we had from beginning to end in putting their celebration together. A lovely intimate group who got to enjoy the best of food and beverage and views. We had the grand piano and a pianist playing through lunch and after, and it was nice to see how much dancing actually happened. Being a lunch time event the couple left by going down to the beach on the cart, how fun. This way it didn’t matter if it was windy and they got dirty!! Thanks to http://www.ronbrazil.com for the photos. Until next time, off to do a wedding. JUST TO LET YOU KNOW, I KNOW I BREAK THE BLOG RULE BY WRITING A LOT (LIKE MY TIMELINES TONS OF INFO) MY FEELINGS WON’T BE HURT IF YOU ARE JUST GOING THRU THE BLOG LOOKING AT THE PICTURES!! Okay, so today I am going to chat about some not so ‘run of the mill’ options people may know of, or think about. 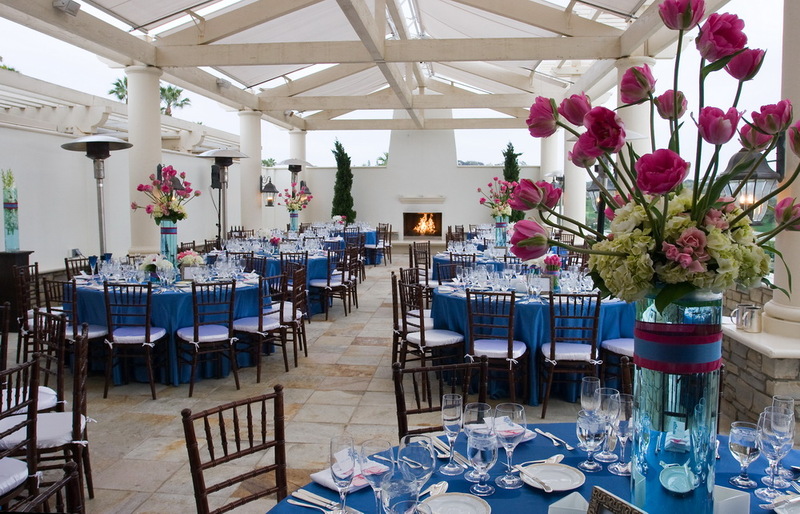 Attended a lovely luncheon at the new Pacific Club in Costa Mesa last week. Last time I was there was probably 8 years ago, it was old and darkish. They then closed for 2 years and rebuilt basically. The result is fabulous. 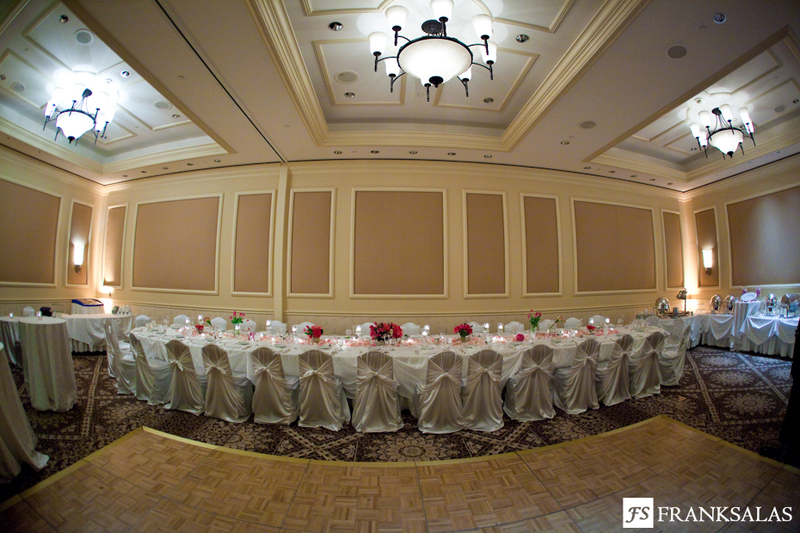 Great ballroom for your celebration and a ceremony site that overlooks their lake. The food was excellent, the chef uses items you don’t see a lot and I loved the end results. We honored Joanie Scott and Barbara Wallace, friends for many years of mine, that are no longer actively planning weddings. A lovely event for two lovely ladies. Brooch Bouquets – My friend Amanda of www.fantasyfloraldesigns.com has always like to add some bling to her designs and can be unique in the designs she creates with the bride, and loves to use brooches when and where she can. So it was no suprise to me when she created these brooch bouquets, what did suprise me was how fabulous they turned out. When I saw them I was blown away, and I have to say I don’t think the photo does them any justice at all, to see them in reality makes you think why ever do a live floral bouquet again, but of course, we will. The three looks are cool, one I called the Kate Spade look and one was very romantic/antique feeling. When she showed them to me she wasn’t sure what was going to happen, but since then she has put them out there and has orders from all over the country, one from London last I heard, and where she was going to create them based on the style you wanted and she would find the brooches and make it, she is even making them when the bride provides her with all the brooches, which means the cost is less. A unique bouquet and one that lasts forever. 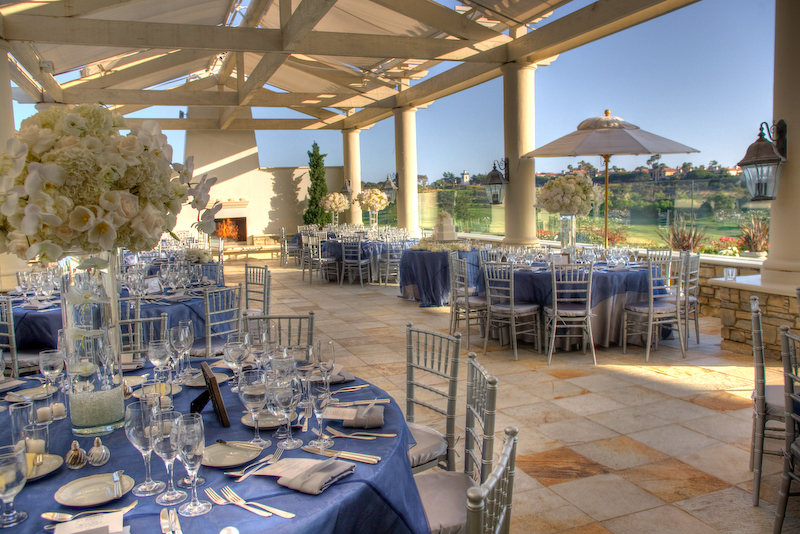 www.ritzcarlton.com/lagunaniguel – So mid season I had a couple who were planning a large celebration in October at a different location in CA, contact me to say that due to a very special family member being ill they were moving their celebration up and were going to do it at the Ritz-Carlton, Laguna, in a few weeks and could I help them with the final touches. They were doing it on a Sunday night and due to this were able to be a bit creative with the location. For the ceremoy they picked my favorite Sunset Terrace (for the lovely intimate ceremonies where you feel you can reach out and touch the ocean below), and as they did not want to do the dinner/dance inside a room, picked the Fountain Courtyard as the location for the dining and dancing. With an outdoor event like this, the music has to stop at 10pm, but we were able to get all the important moments into the celebration and have some dancing time, and when 10pm came, they were all ready to go to bed. It really was a lovely event surrounded by the fountain and greenery and felt like being in a courtyard in New Orleans or Italy, and we even had a band, and the dancing was done on the stone flooring. Holly from the hotel thought some green uplights would add some pop, and they did. It really was a pretty, natural event, and everything everyone at the event was hoping for. Intimate, memorable and special. Joel Eckman Maus from www.studioemp.com was great to work with on this event, as it really required vendors who could work with whatever we needed to do, when we needed to do it, due to the ailing family member. Amanda of www.fantasyfloraldesigns.com did the tropical look florals that totally fitted with the location/occasion. A location you don’t hear a lot about these days, but a property that has a lovely plantation/resort feel and is ocean close, is the Hyatt Newport Beach on Jamboree www.newportbeach.hyatt.com – Earlier in the season I had Will and Bethany’s celebration at this resort. They wanted the formal structured look of the Ampitheatre ceremony site, but were then able to have cocktails in the relaxed courtyard with the trees/hanging lights, and firepit, and then everyone moved into the Garden Room which has lovely windows and patio doors and a fireplace all of which help create an intimate atmosphere for an evening celebration-dinner/dance. The guests really got to experience a different vibe with each event of the celebration. The area/room at the side of the Garden Room was a great spot for the candy station to be displayed, and later we added a french fry station and a specialty coffee station. Allison of www.bleucotton.com was our key shooter on this wedding, but her husband wasn’t busy that night, so he came along as her second, so lucky Bethany got two great photographers, her album is going to be awesome. Elaine and the gang from Naples www.napleschambermusic.com provided the cere & cocktail music, and Amanda www.fantasyfloraldesigns.com did the florals for this one too (boy I am just realising how many of my couples pick Amanda to do their florals, must be her creative streak they love), and Fusion provided the chaircovers, that really softened the room and gave a romantic feel with all the candles and fireplace going. 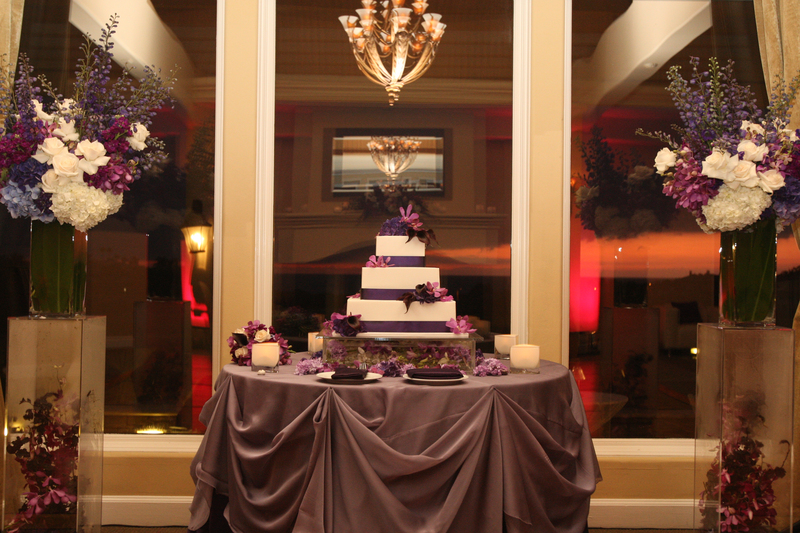 You will notice that I am big about the cake being centered in the room, not off to the corner. A concern to the bride sometimes, but have never had a mishap. 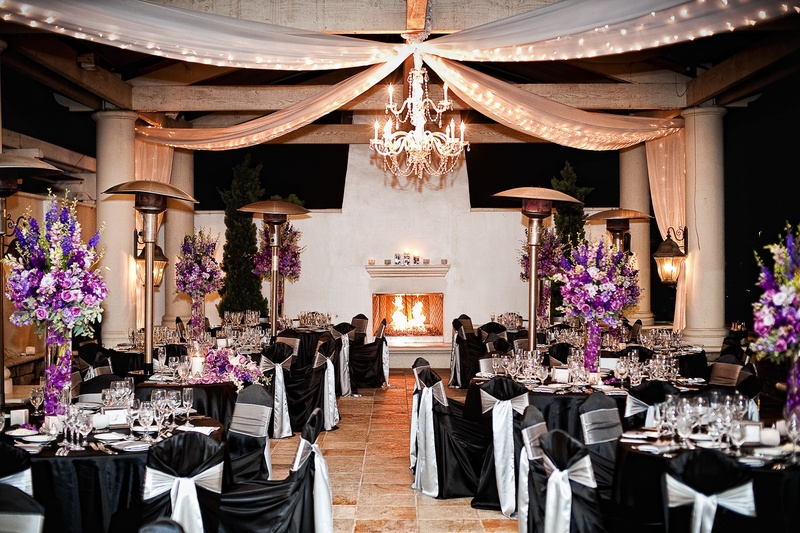 I love all the guests having access to see it and it being a focal when they walk into a beautiful room. The fun thing about what I do, is that even though I am so fortunate to look at the ocean from my ‘office’ (my office being http://www.ritzcarlton.com/lagunaniguel and the http://www.stregismb.com) most of the time, I do get to work at other locations. Some bride’s come to me with their locations already set, and some I get to start from scratch with and based on their budget/style and wish list have to get creative and scout out locations. This is fun and challenging for me at the same time, and I am always surprised at some of the great ballrooms/locations and packages out there that most couples would never find or know about if they didn’t have someone like me . Those are the celebrations that at the end of the night I can look back knowing where we started and what we were able to create with a certain amount of money, and feel really good that I helped make someone’s dreams or vision come true, even when they may have thought it may not be possible. 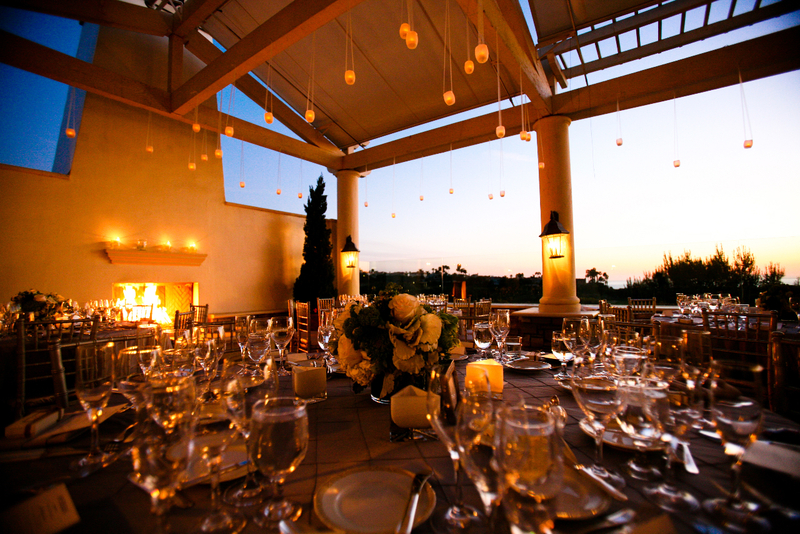 Had a lovely wedding at http://www.rancholaslomas.com this year with Anosheh and Luis. Both medical students that were about to begin their careers in hospitals. So detailed and in sync with each other. Lots of thought put into everything they did. We enjoyed them, and being back at Rancho Las Lomas again. The lovely Peni was assisting on this one, and Miss Brittany was the candle girl who lit all the votives in the dining room and then around the pool area/cocktail tables. Then I had the pleasure to be employed by the mom of a bride who lives in Three Arch Bay and her daughter the bride, who grew up in that colony, was getting married and wanted her wedding ceremony on the beach and then to use the clubhouse lawn for the reception/dinner/dance. Our bride was a very busy doctor and our groom is an actor. So we had a couple who really understood what life was about and how precious it is, and from the creative side of things wanted to put so much of themselves into every component of their wedding, and they did so, beautifully. We did the ceremony on the beach, flip flops for all the guests on the way down and towels to wipe the sand off when they came back up to get their shoes. It was a really personal warm ceremony, and then off to the clubhouse we went. It was a bit cooler than we anticipated for that time of year, so the night before we opted to get a tent canopy (no sides, just the roof) and what a great call that was, it made the event and meant we had people there until the end, which possibly may not have happened otherwise. Thanks to my friends at Classic Party Rentals, Peter especially, that man jumps and makes it happen no matter what the situation is. Everything went off beautifully. This was one I was especially proud of, as our bride really wasn’t sure that they needed a wedding planner, but by the time the day came and then by the end of the day, she was aok with the fact that mom had gone ahead and made that decision and hired me. Whew!!! Confirmed by a lovely note she sent me after the big day. The lovely Teri was my partner on this one, she kept reminding me I hadn’t told her about all the stairs, but I am sure I had!!!!! LOL. Peni stopped by to move all the shoes from one location to another and then went home to rest!!! She also seemed to make some comments about me not being fully truthful about logistics, hmmmm! We used the Laguna Beach Trolleys to shuttle people in from various hotels/lots and then from the cere site to the clubhouse for those that didn’t want to walk, and again at the end when everyone reluctantly had to leave. Ok, I am going to tell you about this placecard table. It may look a bit strange to you, but this was the most personal placecard table we have ever done. In keeping with being organic and earthy, the bride & groom wrote each guests name/table # on a rock they had collected from the beach and shells for decor that they had gathered. The centerpiece is a hat. Grandma had gone shopping for her outfit to wear to the wedding, and had found this fabulous hat to go with it. She was very excited to wear it to the wedding. Unfortunately, Grandma passed away unexpectedly not long before the wedding day. So we used the hat for our centerpiece on the placecard table and hung it in the tree once we turned the placecard table into the cupcake display table (in lieu of wedding cake), so grandma was always present and central to what was going on, and very much there in spirit. Such lovely parents, such a lovely couple. So so lucky am I. Becky came to me with the thought she may like to have her wedding at this location, so to be sure, mom, her and I spent a few hours visiting about 6 other locations, and then she knew, this was the place for her for sure. A beautiful ceremony with the building backdrop, cocktails in the courtyard (while the great Patina Staff moved the dining tables to where the cere was and cleaned the area), then dining back on the lawn, then dancing back in the courtyard. All so close, but gave each event a unique atmosphere/backdrop. They were my most emotional couple of the year, it was so sweet, they are so in love. Poor Becki her mom and dad moved out of the area after the wedding which I know was going to be very hard for her, but at least she has her D.
http://www.designvisage did the hair/makeup on everyone, sorry I don’t have any pics to show you, but Becky looked fabulous. The lovely Peni was with me on this one and she lit all the candles around the dancing area, in fact due to a slight breeze, no sooner would she be done than she would have to do them again!! 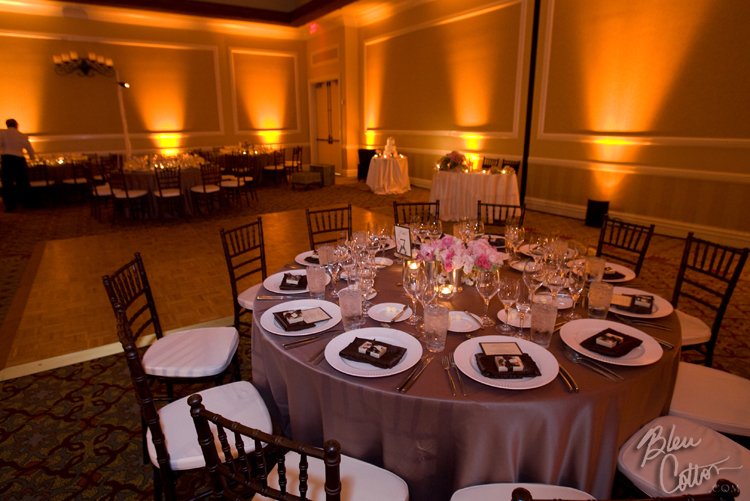 Then Aaron and Christa wanted a water backdrop, and we decided that the Wyndham Orange County was perfect for them. One of the plus’ with this property that I more than anyone else there could appreciate and understand, is that due to the building behind the cere site, everyone is in the shade and no-one is looking into the sun during a 6pm cere. A friend married them and it was the shortest ceremony I have ever heard, but hey sometimes there are only a few words needed to be said, right!! Cocktails were held on the patio overlooking the lake where everyone could see them having their pictures done, and then dinner/dancing was done upstairs in the ballroom. It’s so nice because you feel like you have the hotel all to yourselves. Teri was my right hand on this one and created another great placecard table and kept everyone in line. Jamiee Hubert of http://www.capturingmoments.com is so fun and energetic and created some great shots with the larger bridal party they had, and thank goodness some of them were good sports and walked around the lake to be in the background where Jaimee needed them when she was being creative. Amanda of Fantasy Florals did another great job for this lovely couple. Another wedding that my couple picked Jaimee to shoot also, was Crystal and Peter. After we visited around 10 locations, Crystal fell in love with the ceremony site at the Anaheim Sheraton (the castle one) and this is where their celebration was held. She loved the english garden feel of the ceremony site and the bridge/pond at the far end. The ballroom was a unique shape, kind of triangle which made it hard to center things, but I think we made it all work out in the end. 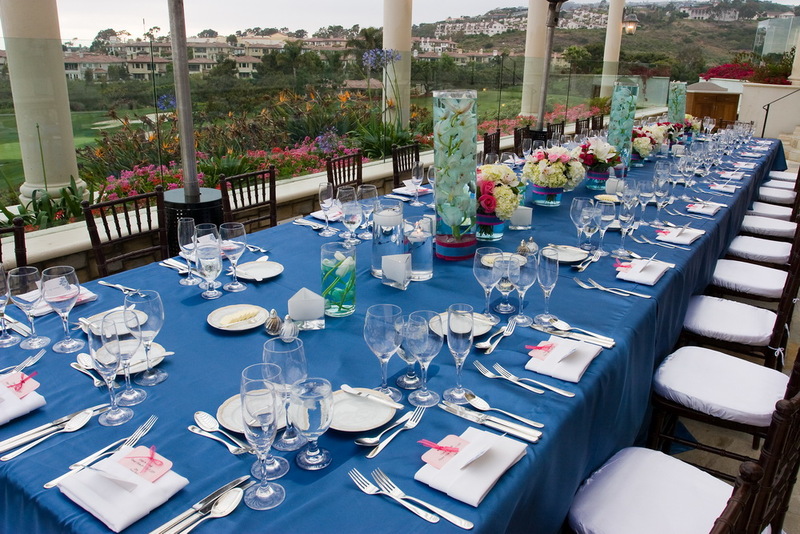 Great parents who wanted the kids to have a really nice celebration, so we got to do linen and chair rentals through Fusion even though that wasn’t the plan in the beginning. Again Jaimee did a couple of really neat shots of the bridal party in the lounge area, that had a movie star 1940s feel to them, I loved them. She is so peppy and cute. 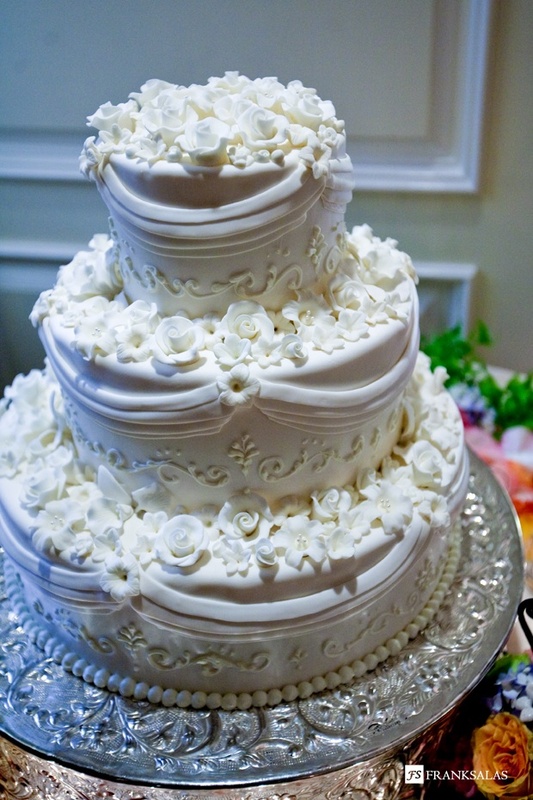 We also used one of the bakers I use a lot at the Hyatt HB, Tomgirl, for the wedding cake, good choice guys!! !